Assisting future students with college planning and the application process. Offering LiveChat on pages dedicated for future students and providing help via chat and tickets. Around 600-700 new contacts a month and well-serviced future students. Students who are one step before going to college need lots of information about their future school: from what the school offers to what the campus culture is like. In search for this information, they and their parents visit school websites. When they are offered help in their search, it’s easier for them to gain the sought knowledge and pick the right school. Grove City College, a Christian liberal arts college from Pennsylvania, wanted to find a way to get in touch with those in-search students and assist them with college planning and the application process. They decided to bring LiveChat on board and talk to students right on the website. The Grove City College’s LiveChat is offered on all Future Students and Student Life and Learning pages of their website. Students chat during the college’s work hours and in the other time, they leave messages using a contact form. Regardless of whether it is day or night, students can reach out to the Admissions staff with a question about the school or ask for help with the application process. To let website visitors know that the help is one click away, Grove City College uses a green Eye-catcher picked from LiveChat’s gallery, which says “We are here”. The Eye-catcher grabs visitors’ attention and informs them that the chat is there. Grove City College also connects with online visitors by starting a chat first. 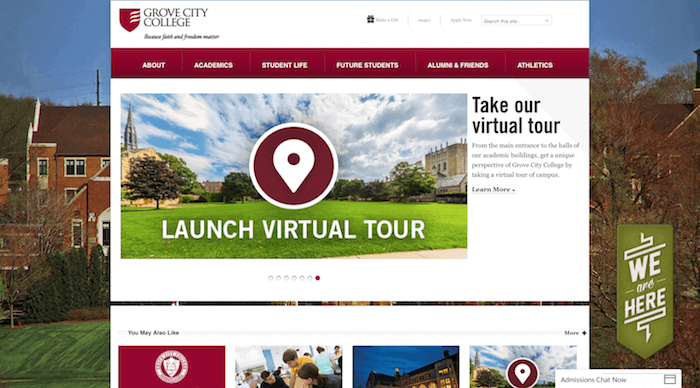 Visitors who spend over 20 seconds on the website are invited to chat by an automatic greeting, an open chat window, which says “Hello, would you like to chat about Grove City College?” A chat invitation appears also for returning visitors and welcomes them back. Visitors who type the word ‘apply’ in a search box are offered help with admission, and those who types in the word ‘visit’ are offered help with setting up a visit to the campus. The Grove City College’s LiveChat is operated by several Student Ambassadors and various staff. When the website traffic is low, there is usually just one person chatting and when there are more visitors online, more agents log into the LiveChat app to chat. Currently, the Admission team gets as many as 53 chats a day, with 1pm EST being the peak time and around 4 to 5 offline messages each evening. 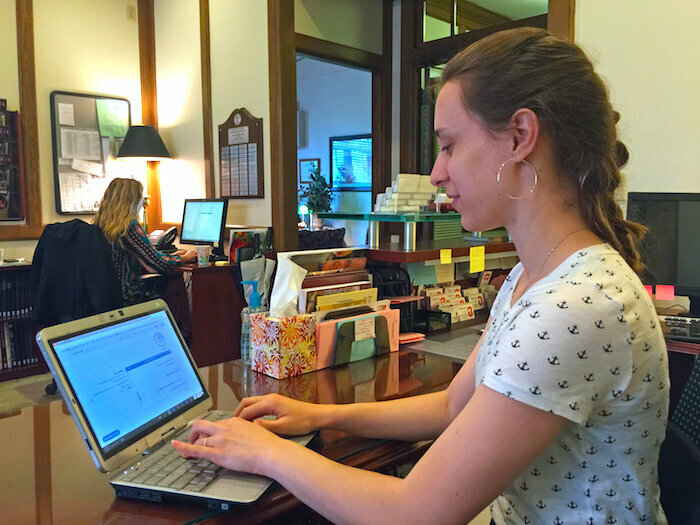 At the end of each day, Sarah, who oversees admissions at GCC, and selected members of her team receive the LiveChat Daily Summary via email. It tells them how many chats happened that particular day, how many of them were rated good or bad, and how many chats were missed. With this data they see clearly the team’s daily activity and areas that need improvement. 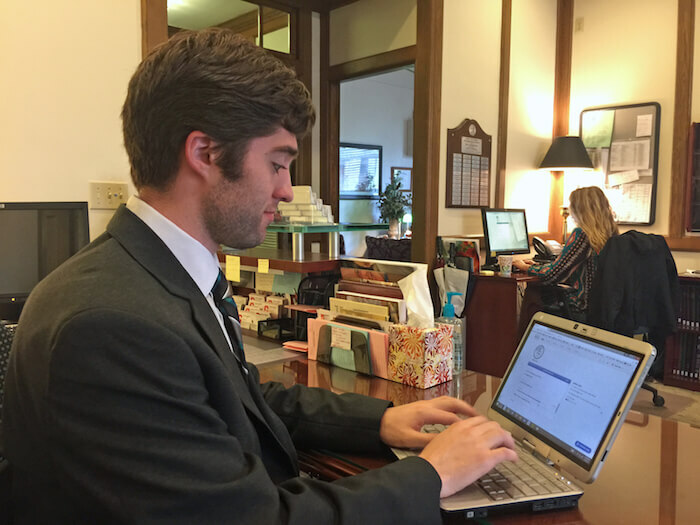 The Grove City College’s LiveChat is integrated with Salesforce, a system for overall customer service, which allows agents to be up-to-date on any communication with new or existing inquiries or applicants to the College. Agents can easily access students’ files, check their application status and give them quicker answers to their questions. Since having LiveChat on their website, the admission team hasn’t seen a decrease in calls or emails, and they assume that all chats and offline messages that come in are new leads. Each month, they receive around 600-700 contacts via chat. “We are experiencing more communication due to having LiveChat,” said Sarah. Seeing the potential of chatting with future students and being in service to them, Grove City College wants to have staff available on chat in the evenings as well. Their goal is to be there for students whenever they need help the most. Grove City College from Pennsylvania provides a liberal arts and sciences education across more than 50 majors. Its mission is to bring an excellent education at an affordable price in a thoroughly Christian environment. Helping customers in critical issues, and reaching 94% customer satisfaction. A tenfold jump in conversion rates after introducing LiveChat to the company's website.